Without question, the biggest obstacle facing widespread adoption of the Industrial Internet of Things (IIoT) is interoperability. From a high level, one impediment is the very loose classification of “industrial,” which spans a wide range of vertical markets, including energy and utilities, manufacturing, transportation, and healthcare, to name a few. At a more granular level, many of these industrial sub-segments have evolved domain-specific connectivity transports and service standards, which help optimize networks for the requirements and use cases of the systems and applications they deploy. Unfortunately, while these domain-specific implementations can remedy architectural design challenges related to jitter, latency, throughput, bandwidth, scalability, reliability, or security, they also preclude the free and easy flow of data within and between IIoT systems, as well as across the IIoT ecosystem of industries. A complete reset of the IIoT network infrastructure to a common connectivity architecture is out of the question given the massive installed base of devices utilizing domain-specific technologies. Conversely, the fluid exchange of sensor updates, telemetry information, events, alarms, logs, status changes, control commands, configuration updates, and other types of data is the fundamental tenet of the IIoT value proposition. The Open Systems Interconnection (OSI) model can be used a rough proxy for today’s existing IIoT network infrastructure, at least through layer 4 (the transport layer of the Internet model). Through this point it is assumed that the Internet Protocol (IP) will be leveraged at the network layer for IIoT systems, with either the Transmission Control Protocol (TCP) or User Datagram Protocol (UDP) used as a pipe for transporting data between IIoT end nodes in point-to-point, hub-and-spoke, mesh, hierarchical, or combinational network topologies. Incidentally, many of the leading industrial connectivity frameworks deployed in domain-specific settings today either already use TCP or UDP as a foundation, or are capable of running on them. However, above the transport layer is where similarities with the OSI model and between domain-specific IIoT connectivity implementations start to disappear. Layers 5 – 7 of the OSI model (or the application layer of the Internet model) are responsible for defining how data is structured and parsed by endpoints, which lays the groundwork for semantic interoperability between systems (or the ability to interpret meaning from exchanged data). 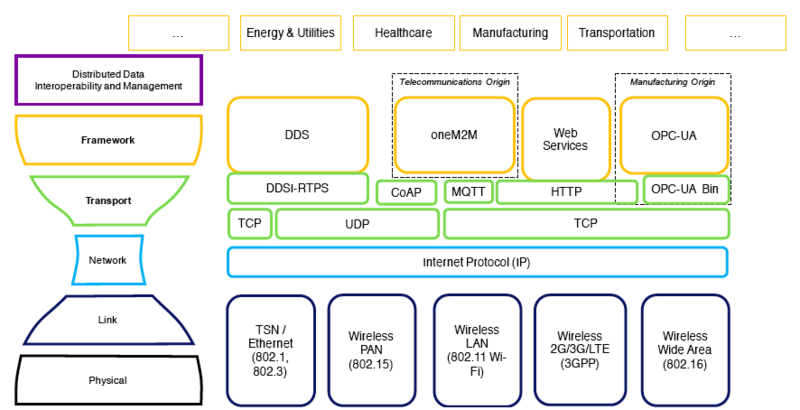 In industrial segments these functions are often delivered through domain-specific connectivity standards or service frameworks such as the Open Platform Communications Unified Architecture (OPC-UA) in manufacturing or the oneM2M layers used in commercial, large-scale consumer, and transportation sectors to connect devices to cellular networks. 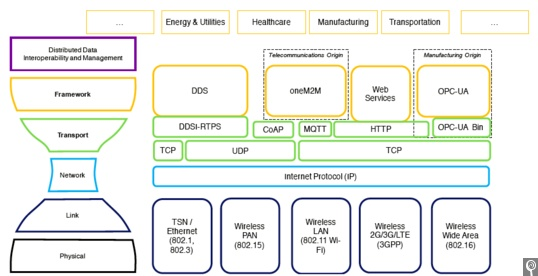 But rather than address interoperability issues between domain-specific standards by adding another comprehensive standard or glue connectivity services, the Industrial Internet Consortium (IIC) recently proposed a re-defined network stack for IIoT systems (Figure 1). This new architecture creates what the IIC calls the “Connectivity Framework” layer north of the transport layer in traditional OSI/Internet models where domain-specific connectivity standards can continue to be leveraged to provision common data structures for the transfer of information between systems. In addition, the architecture calls for the use of a dual “Core Gateway” network hierarchy that enables “Core Connectivity Standards” to communicate southbound to domain-specific connectivity endpoints for last-mile communications, as well as across domains and ecosystems at a higher level (Figure 2). 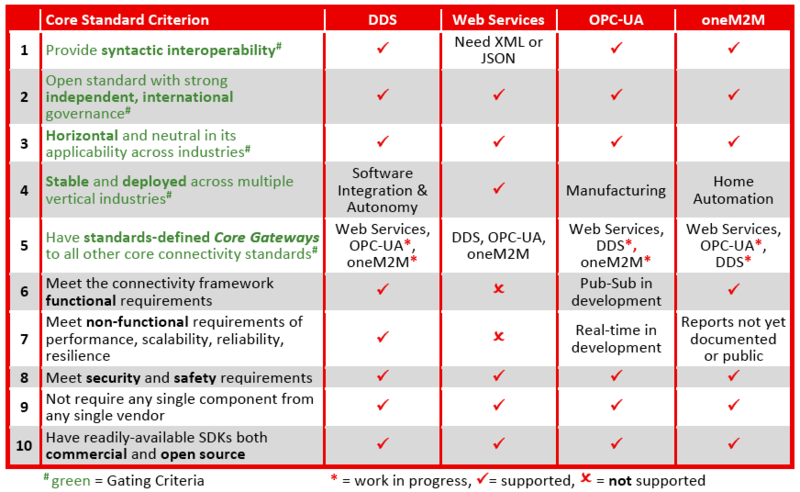 The Data Distribution Service (DDS) middleware standard, a publish-subscribe protocol widely used in the operational domain. Web services using HTTP for human user interaction interfaces. OPC-UA, designed to support multiple transports in the manufacturing industry. oneM2M, which exposes applications to telecommunications infrastructure. The proposed framework is the first step towards delivering a truly interoperable network infrastructure for the IIoT that spans systems and ecosystems. The IIC Connectivity Framework, including an assessment template for evaluating connectivity technologies, can be accessed free of charge at www.iiconsortium.org/IICF.htm.